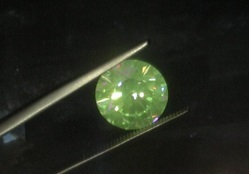 A diamond’s fluorescence can affect the apparent color grade of the diamond. Sunlight has a small concentration of UV light and will cause the diamond to fluoresce to a small degree in daylight. A medium to strong blue fluorescence can counteract the yellow color in a near colorless diamond and make the diamond look colorless. 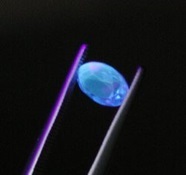 Conversely a colorless diamond with a blue fluorescence can make a diamond appear waxy or milky in sunlight. It is best to judge how a diamond looks in daylight before you make a final decision on whether to purchase the stone.